Mermaid Dreams Do Come True! 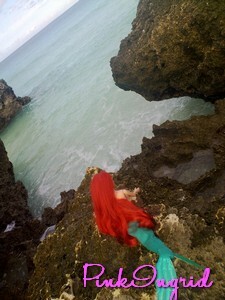 Just like any girl who grew up watching Ariel the Little Mermaid, I’ve often fantasized myself as a girl with a beautiful tail and voluminous red hair, enchanting sailors (err, seafarers) with my voice. Grr. “Wake up!” I told myself. It’s never gonna happen, unless I wear a tail and learn how to swim, flip and roll underwater like mermaids in movies do. 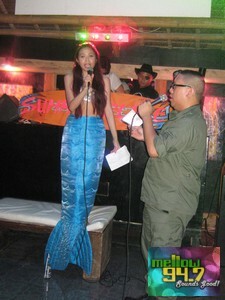 The closest I got to realizing my dream was having a mermaid costume sewn and wearing it to the Mellow947 Halloween event which I hosted in Boracay four years ago. 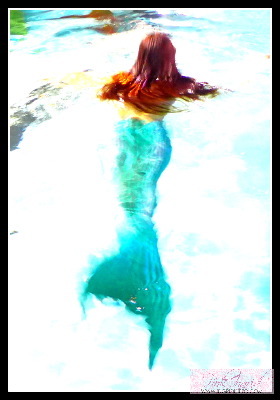 I swept that fantasy under the rug but kept the tail and my inner mermaid alive. 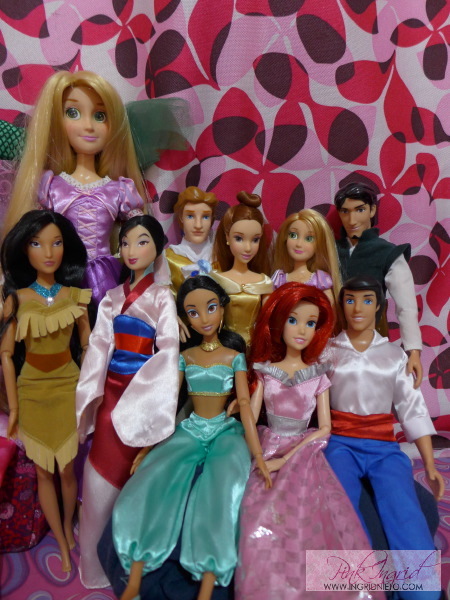 I chose to channel the dream through these dolls I fondly refer to as my daughters. Surprise, surprise in 2013! I’ve heard a little bit about the mermaids in Boracay but didn’t give it much thought until my friend Kimi (my DJ-in-training) was doing it. 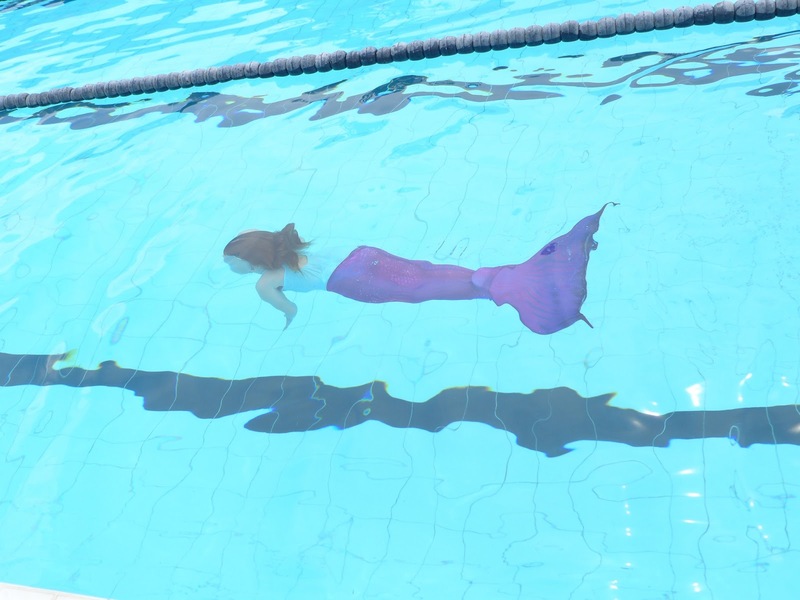 I know for a fact that she’s really into swimming (a young champ at that, she’s joined some competitions and won) but it never occurred to me that there really is a school that conducts mermaid swimming classes! 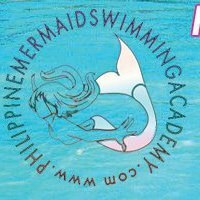 Imagine how high the octave of my “OH MY GOSH” went when our friend Rem de Vera told me that mermaid swimming classes would be held in Manila. More so, I think I hit a high F above C when I found out that Rem was one of the partners. With no ifs or buts, I went on and registered for a mermaid swim camp. Before the actual class, some of the Mellow947 staff went on a field trip to the Manila Polo Club where the classes were being held one Saturday afternoon. 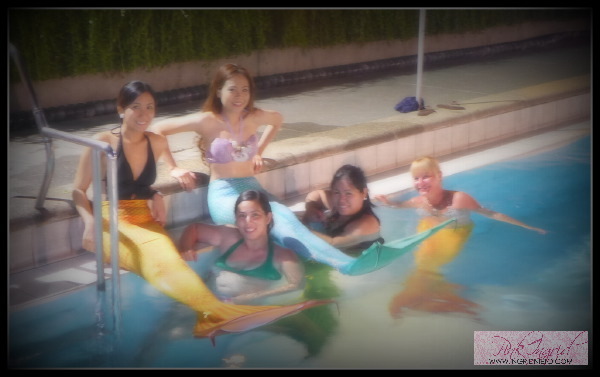 That’s Chief Mermaid Djuna, 2nd to the left in the yellow orange tail. 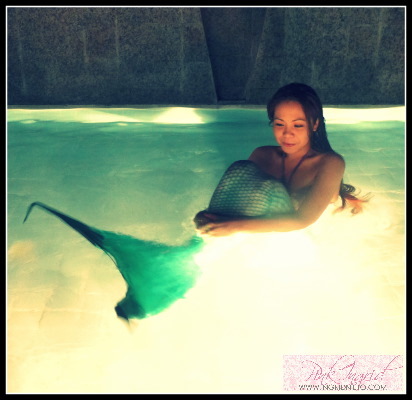 We met Djuna Rocha (I call her the Chief Mermaid), Rem’s partner and one of the founders of Philippine Mermaid Swimming Academy. I interviewed her a bit and found out that she’s really a water baby. 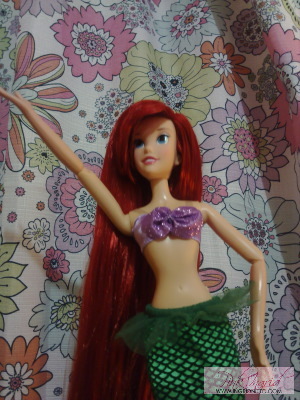 She says she was always fascinated about mermaids and just like me and other girls, she imagined herself as one–the only difference is, she was able to make her dream come true! 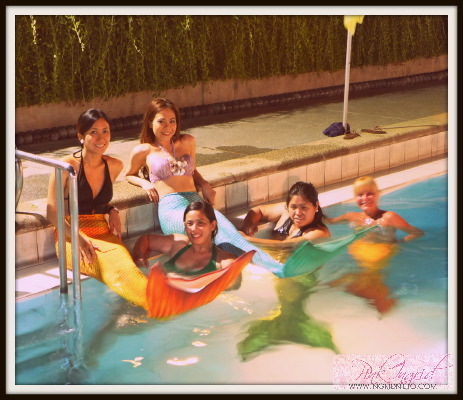 She didn’t surgically get a tail nor magically grow one; the Philippine Mermaid Swimming Academy was borne out of mermaid dreams, an exchange of concepts along with Normeth Preglo and other mermaid partners and an expertise in swimming that brought about a unique swimming activity that also doubles as a great workout. 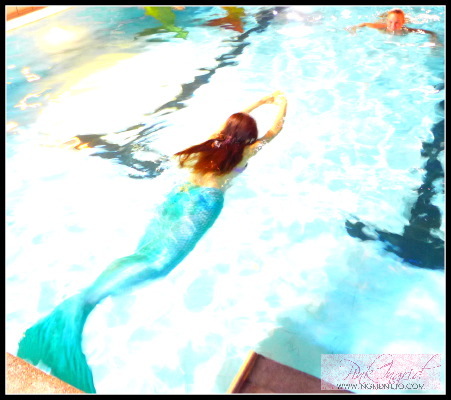 Mermaid swimming has become quite popular in Boracay and Manila just really had to have a taste of it! 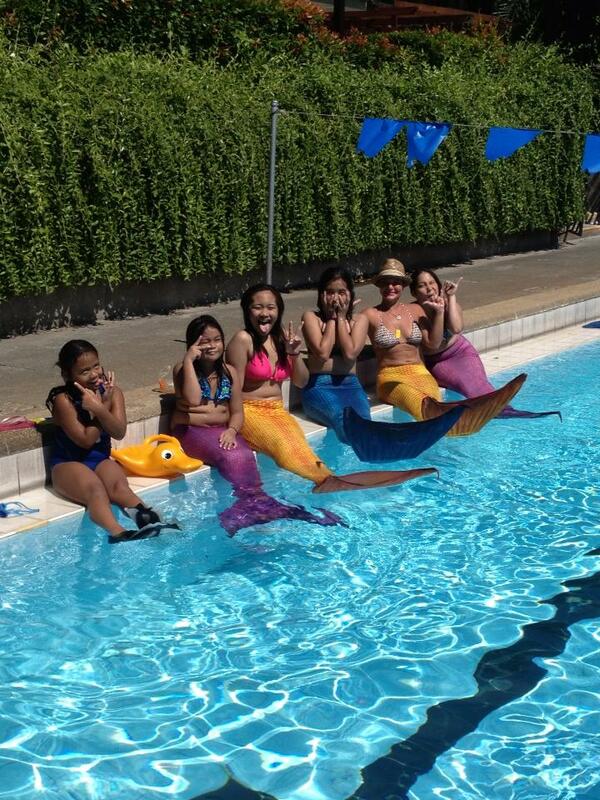 Mermaid swim camps were then arranged early this month, with children, teenagers and ladies signing up for the classes. Of course, you get to pick your tail (small, medium or large) based on the size of your feet. With your swimwear (seashell bra in my case) on, you slowly ease into the tail submerged in the water, pulling it up like you’d wear a pair of pants. 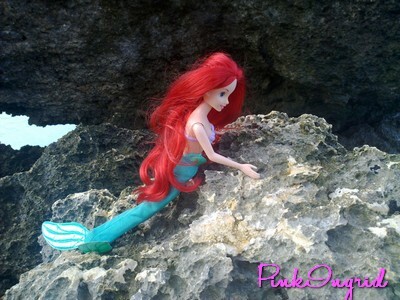 First, we were taught how to easily stand on our fin, learning how to balance in chest-deep water. Djuna then talked us through the the breathing, rhythm and mermaid swimming style. Of course, I was all ears. I had to keep reminding myself that my feet are bound together by the tail so trying to flip and kick like the usual was not gonna work. I did notice though that the tail does help propel one forward. You just have to get used to the fact that it’s kind of heavy and you just need to attain a certain kind of balance to get yourself moving. The Mind-blowing Sale at The Body Shop!